These two constantly crack me up. We currently have 14 hens and two roosters, but right now Tuffy and Cheeky are the only ones out on the loose, which is probably a good thing because otherwise I'd spend at least half of each day watching chicken TV. If all goes according to plan, though, this group of seven hens and one rooster will be let out tomorrow, in what we hope will be a successful and safe free ranging experiment. In the meantime, Tuffy and Cheeky rule the farmyard, the Shack yard, and part of the front yard. At night they sleep in their own cozy little chicken tractor (another experiment, which now boasts a cute nesting box Joe made them last week—after we finally found where they'd been laying their eggs), and even though they get to scratch around and eat whatever they want all day long (you should see how orange their yolks are), as soon as they see me outside they come crashing—there's no other word that quite describes it—across the yard hoping for treats. It always makes me really glad they aren't any bigger. I keep picturing myself being rushed by crazed four foot high chickens. Are you a fine feathered friend fan? You'll find all the 2011 posts about our chickens here. And there are links to lots more chicken photos here. 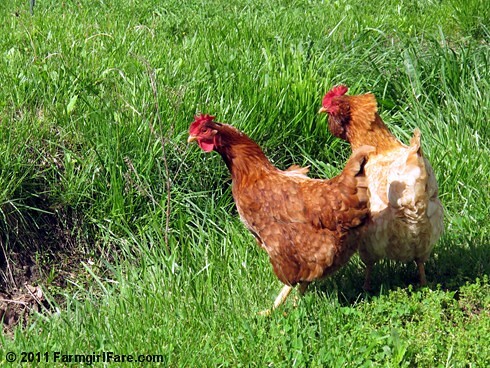 © FarmgirlFare.com, where some of us probably have a little too much imagination, especially when it comes to chickens. Free range eggs are the absolute best!!! I am so happy that you finally have them!!! Makes me shudder to think about feeding/treat time on an ostrich farm. This is too cute! Love the title of the post! I so love to watch chickens being chickens-- free ranging and happy as clams the way they were created to be!! Love the dance video-- I need to make one.....'nuf said. I'm curious, what is it about "eating whatever they want" that makes the yolks so orange? No matter how many times I come thru the gate in a day, the hens run around the hen house to see what I brought them. The last 3 or 4 pics crack me up - hens galloping off across the field in search of whatever. They're so intent and serious about it, like they get paid by the bug or something. I love to call our hens in the middle of the day. They come running to see what goodies we have. They have their own coop for night but spend their days in the pasture. Love the hen pics.